maker*land. : How to remake an adult t-shirt for a child. How to remake an adult t-shirt for a child. I've been trying to get around to resizing a heap of t-shirts that I've been collecting from charity shops, so that they fit Cameron. And I have about a thousand. Well, maybe not quite that many but certainly A-LOT. Concert and festival shirts, Harley Davidson shirts, band shirts, shirts that you can't read because they are from other countries, retro Star Wars and Coca Cola shirts, sporting team shirts; you name it, I probably have it. I love customising shirts for Cameron, firstly because I know no-one else will have one, and secondly, because it's dead easy. You only need basic sewing skills to make what looks like a store-bought t-shirt. This isn't one of those t-shirt resize methods where you stitch a seam here and a dart there, and have something at the end that sort of resembles a t-shirt. I totally remake mine, almost from scratch, using a pattern and materials from the original garment. I like a t-shirt to look like a t-shirt, not a botched up mess. It may sound time consuming, but trust me, it's not. And its easy. You should know by now that I don't do hard! I have a favourite pattern that I usually use, which came from a back issue of Burda magazine, but you can use any classic t-shirt pattern. Any of the big name companies should have at least one suitable pattern you can use (this one from Kwik Sew looks pretty good). Now, I like to trace all of my patterns onto sew-in Vilene or tracing paper, so that I can make any fitting adjustments without having to stab into the pattern. It's probably a good idea in this case, because you need to cut in a shoulder yoke. See what I mean? If I cut it like this, it would certainly look a bit crap, to my mind, anyway. Oh, I am a pedantic thing. Such is the joy of being me. We need to manipulate the pattern to get it to work to our advantage. So this is what we do. Take the front piece of your (traced) child's shirt pattern and measure about 4cm from the shoulder and mark at the neck edge. Then measure about half way down the armhole and mark with chalk. Now, draw a line connecting the marks. Now, you are left with the main piece of the shirt, and a shoulder yoke. You now need to re-draw these adding a seam allowance to the edges you just cut (check your pattern instructions, but generally 1.5cm is the standard). If your t-shirt has a graphic on the back as well, the same thing can be done to the back pattern piece, if you need it. And, yep. That's it. Now, your pattern piece will sit more squarely over the t-shirt graphic. Next, to the shirt you have chosen to chop up. Place your pattern on the shirt to make sure it's big enough. Do a test run on a shirt you won't mind botching up, just to be sure. I totally brutalised a genuine Foo Fighters 2005 European tour tee by not road testing my pattern first (all is not lost, Sophie May will be sporting a teeny version soon, so watch this space). Please don't wreck a t-shirt you absolutely love, trying this the first time around. Firstly, try it out on some op-shop finds you couldn't care less about. I must say, I shed a little tear when I stuffed up my Foos' shirt *sniff*. First of all, unpick the t-shirt's ribbed neckline. This is by far the most tedious bit, because they are overlocked on. You will be using this ribbing for your new shirt so try not to shred it. But it is boring and fiddly. I usually do my unpicking while watching the daily re-runs of Roseanne, because I've seen them a hundred times before. But despite that, she still makes me laugh hard. Probably not a good thing to be doing when you have a stitch ripper in your hand, but I haven't injured myself yet *crosses fingers*. Cut the seam on the ribbing to give yourself one long piece. Leave it folded lengthwise until your ready to attach it back onto your shirt. Next, cut along all the seams of your t-shirt. Up the side seams, around where the sleeves attach to the body, and the shoulder seams. Once you've separated the sleeves, cut along their seams. Cool. Now you have four flat pieces: a back, a front and two sleeves. Pin your back and front pattern pieces to the corresponding t-shirt pieces and cut. If your shirt is big enough, you can cut the shoulder yokes from the bottom of the shirt. I managed to fit my yoke pieces on the shoulders of the original shirt. If there's not enough fabric, you may have to check your stash to see if you have some matching jersey fabric. It's probably a good idea to buy 30 or 40 centimetres of jersey to keep just in case you need it. Or, use a contrasting colour (this is a great idea if your re-inventing a masculine design for a girl: you can use pink or some other girly colour or print). If you're really desperate, your partner or friend or child probably has a t-shirt scrunched in the back of a drawer that he or she won't miss. Be sneaky. I incorporate the t-shirt's original sleeve hem into my new shirt, because it's something less I have to do. Check your pattern instructions to find out what the hem allowance is. If it's, say, three centimetres, fold up three centimetres on your pattern's sleeve opening and fold. Place the fold you just made on the fabric sleeves edge and hey! 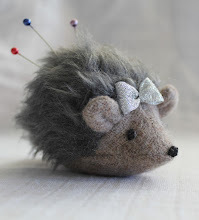 Instant hem. Cut away! Using a stretch stitch (the pattern instructions will tell you), attach your fabric shoulder yokes to your fabric front, and then treat as one piece. Again, my finicky and sophistic nature means I like to topstitch mine on the right side with a straight stitch. I like the finish it gives, but it's totally optional. Then, make up the shirt as per your instruction sheet. The order of this is generally shoulder seams, attach sleeves, then fold and sew each of the undersleeve and side seams in one fell swoop. And again with the top-stitching OCD. All that's left is to hem your shirt as your instructions state, and Ta-daaaa! 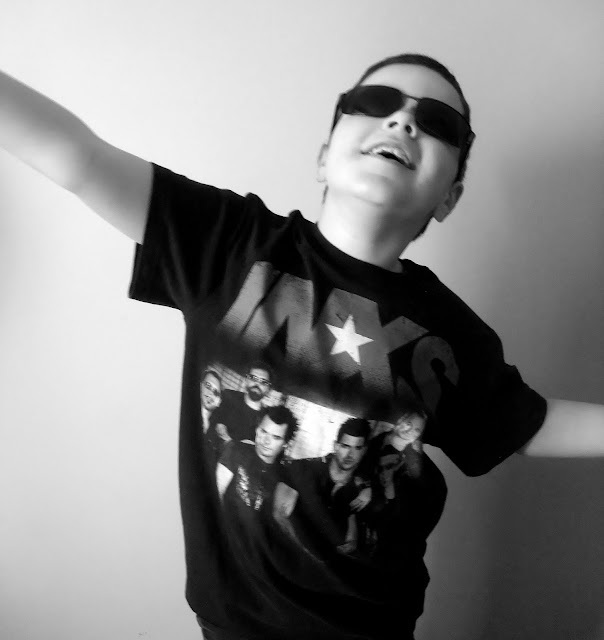 You now have a miniature version of the t-shirt you started with. Once you get the hang of this, you will be hitting the local charity stores looking for cool t-shirts to re-do for your littlies. And to celebrate the end of this tutorial, it's time to channel the late, great Michael Hutchence. Or perhaps not. Happy making! What a cool idea! Thanks for sharing this! That's an awesome post! Thank you so much for sharing this great tutorial! 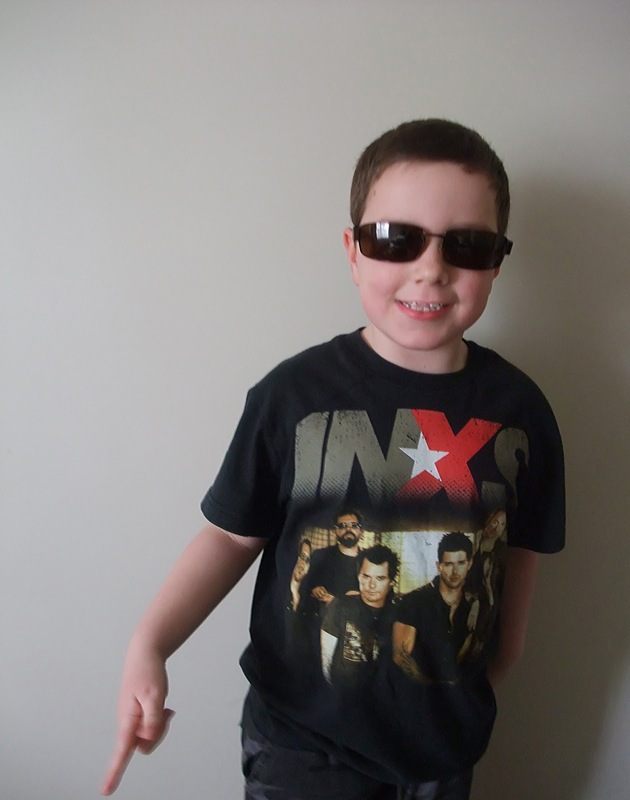 Words can not express how much I LOVE INXS! Best refashion ever! Thanks for linking to Upcycled Awesome. Moving the shoulder seam was BRILLIANT !! Wonderful solution !! Fab tutorial! I will be reworking some tees for my little boy for sure. Thanks so much! amazing, I don't have a tshirt pattern, but will use one of my little boys as a template. 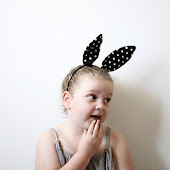 Super quick bunny ears for Easter. ...or follow us on Instagram! © Maker*land 2016. Simple theme. Powered by Blogger.